The Rec Center will be closed Nov 22 and 23 for Thanksgiving. Normal hours resume on Sat Nov 24. We wish everyone a safe and happy holiday. With air quality sticking in the red zone from the thick smoke of the Camp Fire, all outdoor classes have been put on hold since Friday, November 9. Indoor classes and activities, such as Zumba, will continue unless the air is extremely bad. The schedule for outdoor classes is being pushed back so that, if possible, classes will be made up at the end of the season. If not, Rec & Park will issue refunds for cancelled dates. San Francisco Youth Baseball League individual registration begins Saturday, November 17 at 10 a.m. Games begin in March. The league is collaboration between Rec and Park and the San Francisco Fire Department's Flame Program. 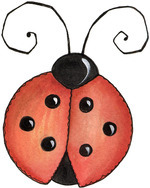 It serves boys and girls ages 4 to 14 in six age-based divisions. Fees cover coaches, games, practices and uniforms. Register online at https://apm.activecommunities.com/sfrecpark/Home or visit Upper Noe Rec Center. Registration for Winter Activities begins Saturday, December 15 at 10 a.m. Add classes now to your online WishList and register for them all with one click. View the Winter Catalog and register online at www.sfreconline.org or stop by the Rec Center office to do so in person. always handy to have around. 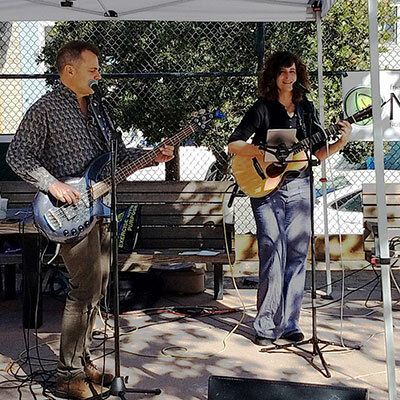 The Ladybug Gardener group was featured in the November issue of the Noe Valley Voice in an article about volunteerism, Giving Back in Noe Valley www.noevalleyvoice.com/2018/November/ . For the bit about Joan and Upper Noe Rec Center, see pg. 10, There Are Many Ways to Give. 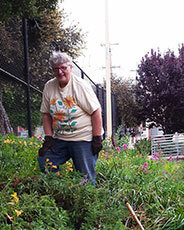 Ladybug Gardener Joan Lionberger in the Native Plant Garden (right). 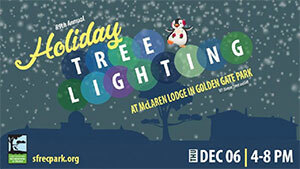 The 89th Annual Holiday Tree Lighting at McLaren Lodge (501 Stanyan Street) in Golden Gate Park on Thursday, December 6, from 4-8 p.m. This FREE family-friendly event will feature toboggan rides, snow play area, carnival rides, live entertainment, cookie decorating, visits with Santa and more! There will also be free admission to the Conservatory of Flowers, which will feature a holiday light show! In addition, because it's the season of giving, the San Francisco Police Department is hosting a toy drive at the event. All are encouraged to bring a new, unwrapped toy to be given to a family in need.